Listen, I get that speculation is fun. It’s why people liked INCH Pick ‘Em, why we like mock drafts and handicapping the Oscars. But there comes a time when it gets to be too damn much. Welcome to another edition of the INCH 4×4, where you get all of the NCAA Tournament speculation with none of the math. And this time around, I’ve got an axe to grind. We all know an NCAA computer somewhere in Indianapolis determines the 16 teams most deserving of an invitation to the NCAA Tournament based on concrete data. That’s fine, I guess. Letting the computer cull the field makes the selection committee’s job real simple. As long as they can read a spreadsheet, count to 16, and then divide by four, they’re pretty much in the clear. It certainly keeps the scrutiny to a minimum. The INCH 4×4 represents how we think the NCAA Tournament field will look WHEN THE BRACKET IS ANNOUNCED Sunday, March 24 at 9 p.m. ET on ESPNU. We’ve touted the INCH 4×4 as all of the NCAA Tournament speculation with none of the math. Like we’ve said a million times before, the PairWise rankings are relevant on just one day—the day in March the selection committee sits down and actually plots the field. Focusing on the week-in, week-out fluctuations is an exercise in futility. Besides, in some highly unscientific research Joe Gladziszewski and I did a while back—I think we looked at previous tourney fields one afternoon we were bored—the computer rankings tend to line up with winning percentage the vast majority of the time. In most cases, it doesn’t matter who you beat, just as long as you beat ’em. Any time you try to put people, places, or things in order from best to, uhh, less best, you’re bound to elicit reactions from those who disagree with your opinion. For example, leaving Nebraska-Omaha and Boston University off this list won’t go over well with some people. But, hey, the line had to be drawn somewhere and this time around those two teams were just below it. 1. Minnesota (17-3-4): “He loved the Golden Gophers but he hated all the drawn-out winters,” sang The Hold Steady lead singer Craig Finn, who grew up in the Minneapolis suburbs. If Don Lucia’s squad keeps playing like this — unbeaten in its last 10 and 12-1-4 since Nov. 9 — fans won’t care about the cold and snow. 2. Boston College (14-5-2): The Eagles are 3-4-2 in their last nine games since Nov. 30. Last season, BC went 2-5-1 between Dec. 9-Jan. 21 … then won 19 in a row. 3. Quinnipiac (18-3-3): The Bobcats’ record against foes from the CCHA, ECAC Hockey, Hockey East, and the WCHA is 16-1-3. They’re 2-2-0 against Atlantic Hockey opponents following Tuesday’s win against UConn. Jeremy Langlois (pictured, right) had a pair of assists in that game. 4. Western Michigan (14-6-4): Got to thinking about college hockey in Michigan. If I was asked to rank Michigan’s college hockey teams, I think it’d be Western, Ferris, Lake Superior, Northern, Tech, Michigan, and Michigan State. If you’d been away from college hockey for 15 years and saw that list, you’d be floored. 5. New Hampshire (14-5-2): Here’s a sign your penalty kill is pretty good: The Wildcats have allowed five power-play goals and scored four shorthanded goals. Has a team ever broken even or finished in plus territory in that regard for an entire season? 6. North Dakota (13-7-4): We put Danny Kristo on our 60-Percent Season Review All-America team, but linemate Corban Knight, who enters his team’s weekend series against St. Cloud State with a 19-game point streak, is just as deserving. 7. Miami (13-6-5): Since reeling off an eight-game unbeaten streak from Nov. 3-Dec. 7, the RedHawks are 3-4-2 in their last nine games and, perhaps more alarming, have scored a total of 11 goals during that span. 8. Yale (11-4-3): The Bulldogs don’t lose often, but there’s been a complete absence of defense when they do. In their four defeats they’ve given up 19 goals, compared to 29 goals allowed in their 14 non-losses. 9. UMass Lowell (13-7-1): Who’s hotter than the River Hawks, winners of nine in a row? How about UML freshman goalie Connor Hellebuyck — he’s been victorious in each of his last seven starts and has a 0.95 GAA and a .964 save percentage during that stretch. 10. St. Cloud State (14-10-0): NoDak’s Knight has some competition in the scoring-streak department from the Huskies’ Drew LeBlanc (pictured, right), who enters the weekend with a 13-game point streak. LeBlanc has two goals and 18 assists in those 13 matches. 11. Denver (13-8-4): It’s almost unfathomable to think that prior to last weekend’s back-to-back losses at St. 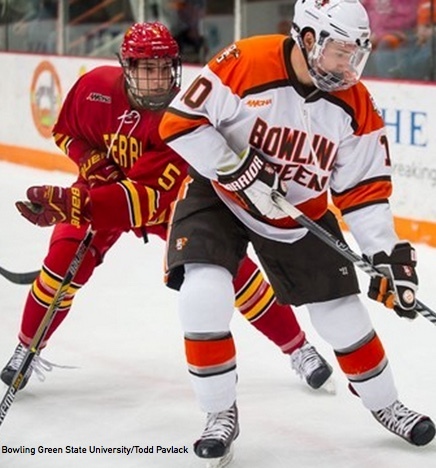 Cloud State, the Pioneers hadn’t been swept by a WCHA opponent since Nov. 14-15, 2008. Back then, Justin Bieber was only annoying to people in his hometown of Stratford, Ont., not the entire world. 12. Notre Dame (15-9-0): For a team that’s far better playing with a lead, the Fighting Irish picked a bad time to struggle offensively — they’ve scored 10 goals in their last five games. On the year, Notre Dame is 2-6 when trailing after one period and 0-9 when behind after two periods. 13. Minnesota State (15-8-3): Since taking over as the Mavericks’ starting goalie on Nov. 10, freshman Stephon Williams has amassed a 12-4-1 record, a 1.69 GAA, a .930 save percentage, and four shutouts. We’re now into mid-January, which is a little more than halfway through the college hockey season. And being sticklers about facts and whatnot, it seemed a little disingenuous to call this a mid-season review, since we passed that mile marker a couple weeks ago. And while we intended to put together some sort of look back at the first half of the season, we opted to enjoy a couple weeks of down time during the holiday break. So instead of a mid-season review, we here at The INCH Writers bring you the 60-Percent Season Review, or the Three-Fifths Season Review if you’re down with fractions. It’s gotta be Quinnipiac, right? One month into the season, the Bobcats were 3-3-1 after losing to American International in Hamden. Since then, they’ve gone 14-0-2, moved into the top five in both national polls, and, more importantly, are 11-0-1 in ECAC Hockey play — the Bobcats, who’ve outscored league foes by a 44-16 margin, enter the weekend with a 10-point edge over second-place Princeton. Senior goaltender Eric Hartzell’s been a force, posting a 1.42 GAA and a .934 save percentage in his last 16 starts. Would you believe Wisconsin? We had the Badgers in our preseason top 10, but they got off to a terrible start. Among other occurrences, touted freshman forward Nic Kerdiles was suspended for the first 10 games for a violation of NCAA rules, leading scorer Mark Zengerle (pictured, right) missed a half-dozen games with a broken finger, and assistant coach Bill Butters tendered his resignation a month into the season. Saying the Badgers have turned things around might be a tad premature, but the signs are there. Kerdiles and Zengerle are back, junior forward Michael Mersch is on a hot streak, and the goaltending tandem of Landon Peterson and Joel Rumpel have been terrific. Wisconsin enters this weekend’s non-conference series with Miami with a 10-game unbeaten streak, its longest since the national title season of 2005-06. Quinnipiac’s Hartzell is a natural choice; with 17 wins this season, he’s more than halfway to matching the number he amassed in his first three seasons with the Bobcats. So, too, is Nebraska Omaha forward Ryan Walters, who has 36 points in 24 games for the WCHA co-leaders. We’ll go with Ohio State goalie Brady Hjelle, however, because no one could have predicted his rise at the start of the season. The senior from International Falls, Minn., played sparingly in his first three seasons — he made 18 starts over two years at Minnesota Duluth before transferring to OSU, where he started five times last season. Hjelle comes into this weekend 6-6-4 with a 1.44 GAA and .952 save percentage. In league play, he’s 6-3-2 with a microscopic 0.92 GAA and a .968 save percentage. The Buckeyes’ 8-9-5 mark isn’t pretty, but at 7-4-3 in the CCHA, they’re in a great position to challenge for a first-round conference playoff bye. Good thing the Michigan basketball team is playing well, because the Wolverines’ hockey team has floundered through the first 22 games of the season and enter the weekend tied for eighth place in the CCHA standings, six points behind seventh-place Alaska and 17 points behind first-place Notre Dame. Not where a team with 11 NHL draft picks on its roster expects to be in mid-January. The primary culprit has been lousy goaltending; the Wolverines rank tied for 54th nationally in scoring defense. Most observers expected a dropoff after Shawn Hunwick departed, but Michigan’s three netminders have combined for a 3.47 GAA and a .874 save percentage. Freshman Jared Rutledge, who was expected to pick up most of the slack in Hunwick’s absence, has a .847 save percentage and a 4.57 GAA — an acceptable number if you’re the third starter in the Colorado Rockies’ rotation, but not so much for a no. 1 goalie. With his team’s 5-2 win over Alabama-Huntsville in Minneapolis last month, Boston College coach Jerry York notched career win no. 925, surpassing Ron Mason for the all-time lead in that category. Based on his record over the last decade — the Eagles have won at least 24 games in nine times in the last 10 seasons — reaching 1,000 wins is a mere formality. A salute, too, to Michigan Tech, which beat Michigan and Western Michigan to win its first Great Lakes Invitational title since 1980. Head coach Mel Pearson was a senior on that team. Boston College has been at or near the top of the national rankings the entire season and while the Eagles are loaded with talent, sophomore forward Johnny Gaudreau (pictured, right) has been the best player in the country from day one of the season. The country’s leading scorer in terms of points per game, Gaudreau started the season with a 12-game scoring streak during which he scored 10 goals and 21 points. And not only is he a productive player, but he’s arguably college hockey’s most dynamic skater. There are others in the POTYTD mix — most notably Quinnipiac’s Hartzell, UNO’s Walters, and North Dakota’s Corban Knight and Danny Kristo — but as of right now, Gaudreau’s the player to beat. With the departures of high-scoring forwards such as Carter Camper, Andy Miele,Alden Hirschfeld, and Reilly Smith over the last couple seasons, Miami has endured fairly significant change up front. Austin Czarnik and Jimmy Mullin helped make the transition smoother last season, and it looks like coach Enrico Blasi has found another keeper in forward Riley Barber. The Livonia, Mich., native leads NCAA freshmen with 24 points, has at least one point in 10 of the RedHawks’ 11 wins to date, and has a negative plus-minus rating in just one of the 20 games he’s played. Also worthy of consideration are Northeastern forward Kevin Roy, Michigan defenseman Jacob Trouba, and a trio of WCHA rookies — Minnesota goaltender Adam Wilcox, Minnesota Duluth forward Tony Cameranesi, and Minnesota State netminder Stephon Williams. With just 10 ECAC Hockey regular-season games remaining and a 10-point lead over second-place Princeton, Quinnipiac is a prohibitive favorite to win the league crown for the first time in school history and earn its second-ever NCAA Tournament bid. The Bobcats have ridden Hartzell to 17-3-3 mark, but coach Rand Pecknold has gotten contributions from virtually every player on the roster — 17 skaters have at least one goal, 10 have scored on the power play, and nine have netted a game-winner. That’s the sign of a coach who trusts his lineup from top to bottom, and the players have rewarded Pecknold for that trust by embracing their roles and, more importantly, producing. F: Johnny Gaudreau, Boston College — Has a point in 14 of the 16 games he’s played to date. F: Danny Kristo, North Dakota — The Count has been red hot as of late with eight goals and eight assists in his last seven games. F: Ryan Walters, Nebraska-Omaha — The junior has already eclipsed his career highs in goals, assists, and points and is on pace to surpass his scoring output from his first two seasons combined. D: Andrej Sustr, Nebraska-Omaha — Pro scouts have long been enamored with the 6-foot-8 Sustr’s frame. With six goals and 17 points in 24 games, he’s proved he’s more than just a big body. D: Trevor van Riemsdyk, New Hampshire — The Wildcats are 9-0-1 when van Riemsdyk scores a point, and he’s a major reason UNH is ranked eighth nationally in scoring defense and bounced back from last year’s funk. G: Eric Hartzell, Quinnipiac — Ranks first nationally in winning percentage, tied for second in shutouts, and third in GAA, all while playing more minutes than all but one NCAA goaltender. Boston College: Here’s a scary thought regarding the defending champs — they don’t usually start playing their best hockey until the final third of the season. Minnesota: The Gophers handled the first half of their schedule with relative ease; the road gets significantly tougher starting with this weekend’s series against North Dakota. North Dakota: Like Boston College, North Dakota doesn’t typically hit its stride until February or so. Getting a finally healthy Michael Parks back in the flow will help. Notre Dame: With Steve Summerhays in net, goaltending hasn’t been an issue. Consistency on offense is another story. Thought about flipping Western Michigan into this spot, but sticking with the Irish … for now.